Like Dance at the Moulin de la Galette, this work was shown at the Third Impressionist Exhibition of 1877. Encouraged by Renoir, Riviere published a journal entitled L'Impressioniste for the exhibition. This was designed to defend the Impressionists against hostile criticism and appeared each Thursday for the month-long duration of the exhibition. On the cover of the third issue was an engraving of The Swing after a penand-ink drawing by the artist. The painting was executed in Renoir's garden at the house he rented in the Rue de Cortot in Montmartre, the location of a number of other works of this period. It is not clear who the models were, but it is suggested that the woman is either the Montmartre actress Jeanne Samary, or the model Margot, while the two men may be Renoir's brother Edmond and Norbert Goeneutte - both Goeneute and Margot appear in Dance at the Moulin de la Galette. 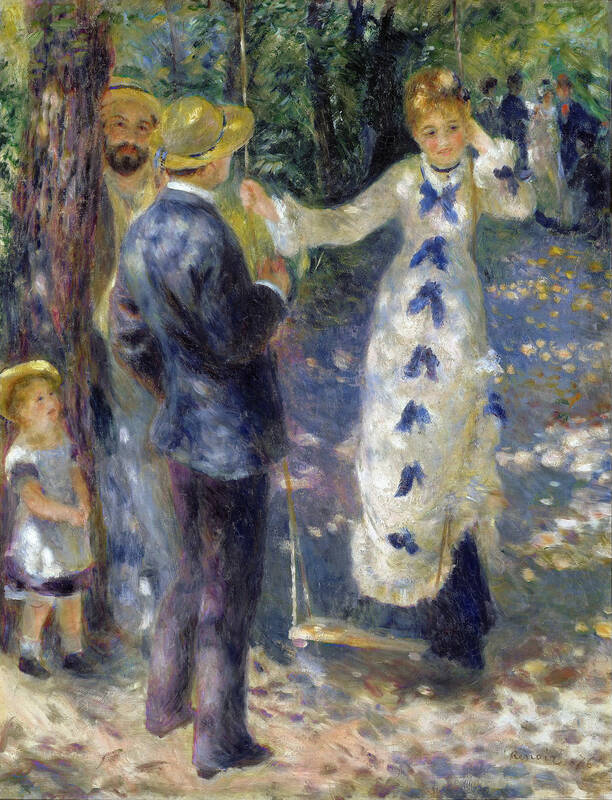 Renoir here depicted similar light effects to those in the latter work: the ground is dappled with spots of light, as is the back of the man in the foreground. This painting is, however, more intimate in tone: the scene is one of quiet enjoyment, with the three figures chatting while a child looks up to them. The child adds an innocent, untrammelled air to the work and distinguishes it from those of, for example, Manet, which are the expression of a much more detached, incisive vision. As in other works, Renoir here creates an artificial world from which the everyday has been banished. Indeed the spirit is much the same as that of such eighteenth-century French painters as Watteau, Boucher and Fragonard, artists who Renoir greatly admired and whose works were then enjoying a revival of interest. Riviere made just this connection in one of his reviews, stating that 'one must go back to Watteau to find a charm analogous to that which marks The Swing'.